LAKE VILLAGE, Ark. -- Tom Cotton has been traveling this large, rural state in a camouflage-painted RV, on the hunt for an “elusive” and “mysterious” Arkansan. This enigmatic figure is one who invariably sides with President Obama on the issues -- a stance generally viewed with disdain in a state that voted for Mitt Romney by 24 percentage points in 2012. Cotton is referring, of course, to his opponent: Mark Pryor, the lone Democrat in the state’s congressional delegation. Pryor is facing his most difficult challenge yet as he vies for a third term. Arkansas has been trending more conservative and Pryor, with his deep family ties in the area, has come to symbolize Democrats’ last best hope for winning statewide here. But given the focus of Cotton’s campaign, it’s as if Pryor weren’t on the ballot and Barack Obama is. The president is the main character in Cotton’s stump speech, with Mark Pryor as the sidekick. During a casual, 11-minute address in Lake Village, Cotton touched upon several issues he connected back to the president: increased health insurance premiums, higher food and gas prices, costly electric bills, regulations on pesticides and farming techniques, the chaos on the nation’s southern border, the Russian invasion of Ukraine, and terrorist threats from the ISIL militants. “We have a chance here in Arkansas not only to turn around our state, but to turn around our country,” he told the group of supporters who had gathered to meet him in the middle of the day. Cotton is crossing the state on an “Arkansas First” tour. But it’s clear that Obama is front and center of this campaign. “Mark Pryor’s been saying, ‘Arkansas comes first.’ It’s not true, not anymore. For six years, Mark Pryor has been putting Barack Obama first,” he said. Republicans challenging incumbent Democrats across the country have been invoking the president in their campaigns. Obama’s unpopularity, especially in red states that could help decide the balance of power in the Senate, figures to be a weight on those incumbents from Alaska to New Hampshire. But distaste for Obama is particularly pronounced in Arkansas, where analysts and voters alike have traced the state’s rightward turn to his election in 2008. Cotton’s campaign hopes to capitalize on that sentiment in November. The congressman often brings up his own parents -- who are featured in his ads -- as examples of the changing nature of politics in the state. While Cotton, 37, has been in Congress for only two years, his military experience provides him with an extra credential in opposing the president on foreign policy -- an issue becoming more pronounced on the campaign trail in light of current events. There is a fear he hears from Arkansans during his campaign travels, the candidate said, that “terrorists from the Islamic state will infiltrate America and kidnap our children and kill them.” Cotton, an Army veteran who did combat tours in Iraq and Afghanistan after graduating from Harvard Law School, said the issue has garnered the most attention from voters he meets at campaign stops. Pryor hopes his family name and ties to the state, along with his style of politics, will protect him from the national headwinds. Pryor made news by releasing an ad recently in which he touted certain aspects of the health care law, but did not mention the law by name. He, too, is invoking national themes on the trail, arguing that Cotton is too conservative for Arkansas. At a campaign event in Little Rock last week, Pryor hit on themes his party is using in congressional contests across the country, saying Cotton has voted against the interests of seniors, students, women, and working families. As several fact-checking outlets have pointed out, funding for food stamps has long been part of farm subsidy bills in an effort to get lawmakers from non-agricultural districts to vote for them. Last year, facing the prospect of defeat by conservatives, House leaders divided the bill into two parts and called for separate votes. Cotton supported the stripped-down bill, but voted against the final version that merged the two. Cotton has argued that food stamp levels have risen under this president. Democrats, facing the prospect of low turnout, hope the issue drives some voters to the polls. The Pryor campaign set up a conference call last week with farmers who oppose Cotton’s stance, and accuse the congressman of bowing to special interests. But it’s unclear how the farm bill vote will influence voters in November. The RealClearPolitics polling average shows Cotton with a 2.4 percentage-point edge. The race has been the target of millions of dollars in advertising from sources inside and outside Arkansas, and figures to remain competitive until Election Day. Even with the political climate as favorable as it is for Republicans, Cotton has had the added challenge of introducing himself to voters across the state and working the retail politics side of things in a state that values personalities. And just as Democrats work to establish an efficient ground game in a challenging environment, Cotton knows that every vote counts. On the trail he asks supporters to tell at least one person they know to vote for him. 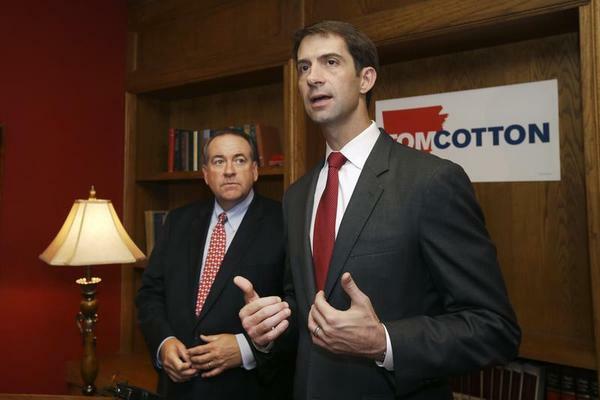 Criticized earlier in the campaign for a perceived lack of congeniality, the ever-on-schedule Cotton has been making a point to shake every hand in the room and answer questions from those who have come to see him.